We deliver products daily from Mill Close Farm, based in Bedale, to the Manchester, Leeds, York and Hull areas. All products are delivered by our team of drivers, in fully refrigerated vehicles. 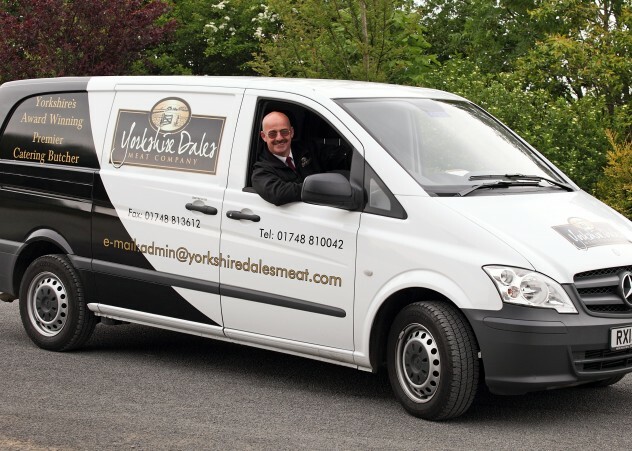 Our butchers work from 4am to ensure that our drivers are able to leave the factory early, meaning that most deliveries are completed by early afternoon at the latest. We are sometimes able to work with customers to specify an early or late delivery, so please get in touch to discuss your needs. Our vans are branded, and our customers have previously commented that their diners have given positive feedback after seeing our vehicles delivering to their restaurant. Our staff are also uniformed, ensuring that we compliment the professional portrayal of your business. Constant Refrigeration – Products are refrigerated during their journey, ensuring that they reach you in optimum condition. Reliability – Using our own delivery drivers and vehicles ensures that we know our products will reach you the same day, our products can’t get lost with couriers. Real Time Tracking – Each van has a tracking device, so should you have a query, we are able to track your order in real time. Professional Service – Our uniformed drivers are able to immediately assist with any issues or queries. You will often have the same delivery driver, building familiarity with you and your business. We deliver to Manchester, York, Leeds, Harrogate, Scarborough, Lancaster, Hull, the Dales, Newcastle, Teeside and the surrounding areas. Please get in touch with us to discuss our delivery areas further.